This is one of my family’s favorite waffle toppers. Peanut butter and bananas are a match made in heaven, and a nutritious—yet equally scrumptious—replacement for gobs of butter and sugary syrup. Toast the waffle and spread the peanut butter over the top. 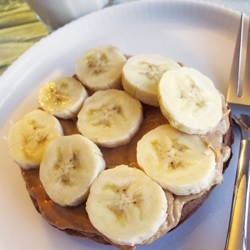 Slice the banana into rounds, and place them evenly on top of the peanut butter waffle.